Unlike some reviews below I quite enjoyed my brief visit to this Wetherspoon's. Review is biased by personal experience, so a botched order or surly service, however infrequent (or embellished) will colour the overall impression. I happened to have friendly & efficient service of a decent pint of Doom Bar (2.50) in a clean, airy & well lit environment. Unusually for a Wetherspoons I had a lengthy chat with the bar bloke, who recognised my accent & spoke of his desire to visit & work in Australia. So my review is biased by a pleasant experience! Large and echoey Lloyds No 1 (i.e. Wetherspoons with piped music). Worst Wetherspoon ever. Visited at 6:15pm on Sunday May 5th 2014. Staff uncooperative and surly. Server obviously determined to sabotage a simple food order. Lengthy process to record correct details for two people, amazingly accompanied by arrogant accusations from the server! Finally charged twice for a drink - separate charge of £5.19 for "beer and burger deal" and additional charge of £2.29 for the beer supplied. After receiving the receipt I questioned this. The server's position was that the beer in question was not included in the "deal" and I was very specific about which beer I wanted. However, it is quite normal to ask "Can I have a pint of London Pride please". I was not challenged about the choice nor told that I would be charged separately. I stated that the "deal" charge was thus incorrect and added that I should have had the opportunity to redeem a 50p Camra Wetherspoon voucher for a separate drink. 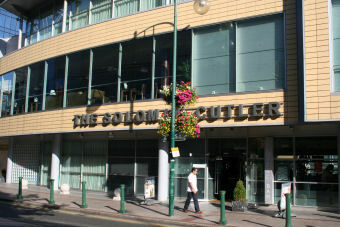 The server, now supported by other staff, stated that the voucher had to be redeemed at time of purchase, pleased with their knowledge of the rules, and refused to take the matter any further. The manager was called over, and the original server shouted out a continuous, lengthy and loud account to establish his position, essentially nothing more other than that I was very specific about exactly which beer I wanted. I did not have much chance to say anything over his outburst. The manager rang through the voucher and I got 50p back against the separate charge for beer. Was the problem resolved? No. I was still charged the full price for a "beer and burger deal WITH ALOCOHOLIC DRINK" - around £5.19 - and I never received an alcoholic drink. I had to pay separately. On the menu the price for a burger with soft drink is something over £4. Further, there is a price for a burger without ANY drink which is something over £3. This is not shown on the menu, but this is what I should have been charged, as I have been in the past in other better managed Wetherspoons. However by now it was clear that all the bar staff were right, I was wrong and I was a troublemaker, and had to accept this overcharging and leave. There was no point in trying further to challenge obstructive staff. Very bad customer service. Took a very long time to get served. Food was well below pub standard. Turkey dinner was actually the processed meat you would put in a sandwich. Asked Gina and Barry (upstairs) if I could get a drink, I�ve been waiting 20min. Barry replies �no you haven�t� and walks off! I understand if you�re short staffed, but this was a joke. Bar was mostly empty, hate to think what it would be like if they were busy. On the upside�.no theres no upside. If you want to fill a hole and don�t mind taking a long time to get served, then go for it. Good luck. Sorry but this place is just bland and the ale choice ain't great either. If you like this sort of place the Brasshouse almost opposite is a better bet.